Pumpkin and black bean chili can be made in the slow cooker or on the stove top. 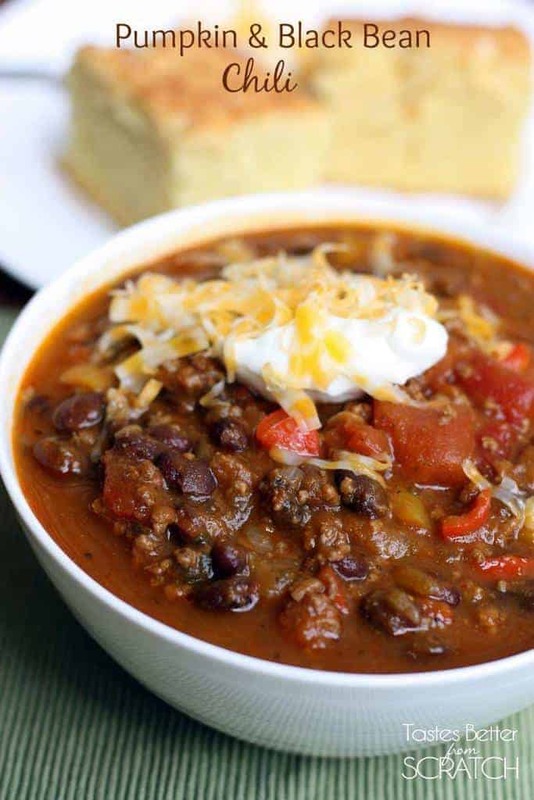 This is a fun twist on traditional chili that is a crowd pleaser! I’m always surprised by the amount of people who have never heard of pumpkin chili! I think to some people it may sound weird, and they’d be turned off by the idea of pumpkin in their soup. But everyone should give this chili a try! It’s absolutely delicious, especially this time of year! The pumpkin adds a creamy texture that I love and the soup is delicious! 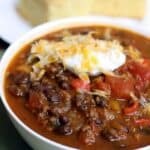 My two year-old couldn’t eat it fast enough, and my husband (who would typical roll his eyes at the name “Pumpkin and Black Bean Chili”) loves it as well! Having just had baby number two, my slow cooker is my new best friend! You could make this soup in a pot, but it’s soo easy to throw in the slow cooker and let the flavors blend together! Heat oil in a large skillet over high heat. Add turkey and brown for 2-3 minutes. Transfer the meat to your slow cooker, leaving oil in the skillet. Add the onion and bell pepper to the skillet and sauté for 1-2 minutes. Add garlic and cook one minute longer. Transfer veggies to the slow cooker. Add remaining ingredients to the slow cooker and stir. Cover and cook on low for 4-5 hours. Love this! Keep those pumpkin recipes coming! I loved it made it twice, but it is to much like soup so I wil use much less broth today when I make it again. But I wish all recipes for crock pots would say what size pot to use. It would help. Thanks. This looks like the perfect item to take to our upcoming Neighborhood Potluck! Thanks lady! Hope you’re getting a little sleep w/ that new babe! Wow, Pumpkin chili. I love the idea and can’t wait to give it a try. This Chili recipe looks amazing! We can’t get enough at our house, so much so that I try and keep it on hand. Thank you for sharing. I followed this recepie and made this monday night. This is very good! You can make this very healthy and low sodium. Great flavor. I cooked it in the slow cooker and cooked it on high the last hour it made a great thicker finished product. I will keep and make this on a regular basis. Would there be a bean sub for black beans? I am fresh out! Hi Nikki, You could use Kidney beans! Happy you liked it! Thanks Lindsey!